I've never been a fan of the dewy foundation look. There, I said it. I prefer more of a matte finish, with a decent level of coverage, that's going to hang around all day. It's been kinda lonely in the matte camp over recent years, as all things sheer and glowy took the beauty industry by storm. Matte was almost a dirty word, in makeup circles, being associated with a heavy, caked on look when the trend was for ever decreasing levels of coverage. But happily, with makeup as with all things in this life, seasons change*. And thanks to some pretty cool scientific innovations, matte is back, and it's better than ever. Launching on February 1st, Lancôme's Teint Idole Ultra 24H benefits from the latest scientific advances and more than 8 years of research to provide a coverage that sounds almost contradictory: high-coverage but natural? Matte but not drying? Longwearing, but comfortable and light? Weary as we are of cosmetic houses promising us the moon, is all this just too good to be true? Well, no actually. This foundation is really very, very good. I can't attest to the 24-hour claim but I've been testing this over the past two months and I feel very comfortable that it will stay in place for as long as it's needed. It has lasted throughout a full day of work, not budged through an after work party and stayed intact for a full day and night of shopping and lunching and cocktails and dancing. Taking pictures of myself is not my forte...any suggestions for how to improve? It applies flawlessly and easily with either fingers or a brush, giving a matte, medium-to-full finish that evens out my skintone and covers up blemishes while still giving a natural, real-skin result. A little goes a very long way, and there is a wide range of shades available for all skintones - Lancôme worked with the Women of Colour Association to make this their most complete global range. I was matched to (and given) shade #35 at the launch event, a neutral shade which suits my skintone perfectly. Now, there are very good scientific reasons for why the product performs so well. These are to do with special polymers that are a different shape and structure and so can offer enduring long-wear and a comfortable finish. To be honest I don't fully understand all of that. But I certainly like the results. What do you think, will you bat for matte or go with the glow?! 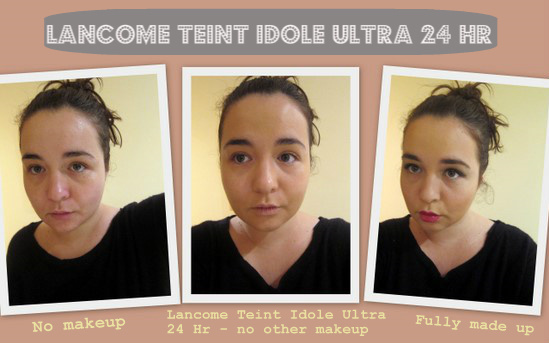 Teint Idole Ultra 24H (€35) is available from February 1st, at Lancôme counters nationwide. * And now this (wonderful) song is totally stuck in my head. Kytzia pout in photo 3. Ohh i hope they do it in crazy pale shades too - have you used estee lauder doublewear, would you be able to compare the two? Sounds like an amazing make up product! This is such a cool post! You're lucky to have skin that looks that good with no makeup! I'm not gone on dewy foundations either, they seem to run off my face no matter what brand I find, and it's always more shiny than dewy on me. This looks fab, it's a little pricey for my budget at the minute but it's definitely one I'll keep an eye out for in a few months time! Great post. Like this alot Emma. My foundation is just about to run out too. Never tried a matte foundation, got to say you make it sound tempting! you look gorgeous!Nice post and very useful love! Arghh.. it is just so hard to find a great foundation... I am never really happy! A flattering angle is slightly above and having your face turned at an angle. Find your sugar side by experimenting :) Front shoots are usually not that flattering and you can see most of the time your hands in front extended.. Every once in a while, hold the camera a little to the right or left, and always try to take pics with one hand, by turning your whole body slightly to the side. You could also try to stand in front of a mirror and hold the camera out so you can see yourself in the screen even though the camera is facing you. yes matte is my favorite. i already have oily skin so can't do anything that makes it any shinier! your skin is also really nice! 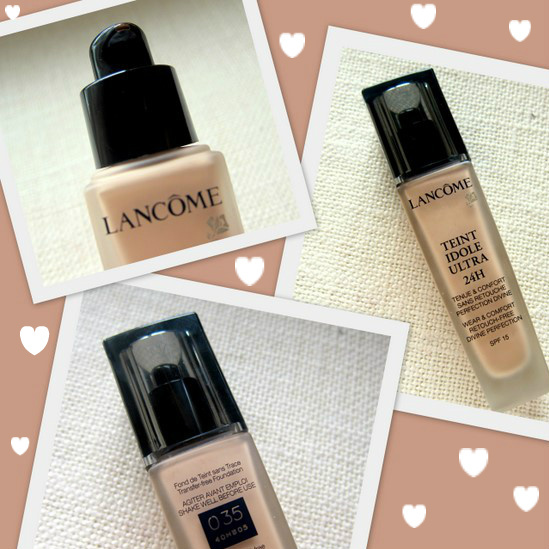 I am a fan of Lancome foundations generally. I used to be a very matte girl myself, but since my skin has gone quite dehydrated over the past year or two I'm a little more cautious....interesting though...Must exert some self-control soon as I am actually quite happy with my current foundation! I have used EL Double Wear and would say this is much better - it makes the skin look glowing and the coverage is excellent. As for the 29 year old worried about how it may look on "older" skin, well I am 53 and can tell you my skin looks just fab with this - and it's much cheaper than the new Chanel one too. I shall stick with this one! Does it look good with flash photography?